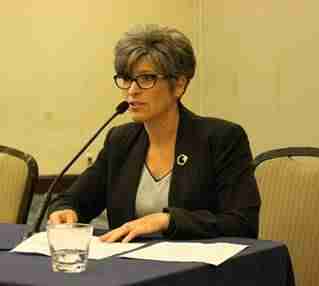 Senator Joni Ernst (R-IA), a member of the Senate Environment and Public Works Committee, submitted comments to the Environmental Protection Agency (EPA) Acting Administrator Andrew Wheeler on the proposed volume requirements under the Renewable Fuel Standard (RFS) for cellulosic biofuel, advanced biofuel, and total renewable fuel for calendar year 2019, and the proposed biomass-based diesel volume for calendar year 2020. Read the Senator’s full letter below. On behalf of Iowa and the state’s agriculture industry, thank you for the opportunity to comment on the proposed volume requirements under the Renewable Fuel Standard (RFS) for cellulosic biofuel, advanced biofuel, and total renewable fuel for calendar year 2019, and the proposed biomass-based diesel volume for calendar year 2020. Agriculture drives Iowa’s economy, and the RFS is critically important to the state’s continued growth and development. A strong and robust RFS encourages consumer choice, investment, and innovation; all while increasing our country’s energy independence. While I am pleased the proposed rule sets the corn ethanol requirement at levels intended by Congress, I remain disappointed that the 2020 biomass-based biodiesel requirement was not increased to accurately reflect current domestic usage and production capacity. Iowa is the nation’s leader in renewable fuels production with 43 ethanol refineries capable of producing more than 4.4 billion gallons annually and 12 biodiesel facilities with the capacity to produce nearly 400 million gallons each year. The industry supports almost 50,000 jobs across the state and accounts for $5.0 billion of Iowa GDP. This underscores the need for honesty and transparency. The Environmental Protection Agency (EPA) effectively reduced the RFS volume obligations by over two billion gallons in 2016 and 2017 through small refinery exemptions, decreasing both corn and ethanol demand. The proposed increase to the amount of renewable fuel blended into transportation fuel is encouraging, but does not account for demand destruction. I respectfully ask EPA to reallocate waived gallons and establish a clear procedure to ensure obligated parties demonstrate “disproportionate economic hardship” before an exemption is granted. Moreover, EPA should follow through on the President’s directive and remove the outdated restriction on the sale of E15 year-round. Granting Reid vapor pressure (RVP) relief for E15 is a no-cost solution that will expand a domestic market for farmers who have been adversely impacted by ongoing trade disputes. RVP relief would not only boost farm income, but also jumpstart growth and development across rural America during a time of economic hardship. The final rule issued by EPA should follow Congressional intent, both the spirt and the letter of the law. I encourage EPA to uphold its commitment to a strong and robust RFS. Thank you again for the opportunity to comment.